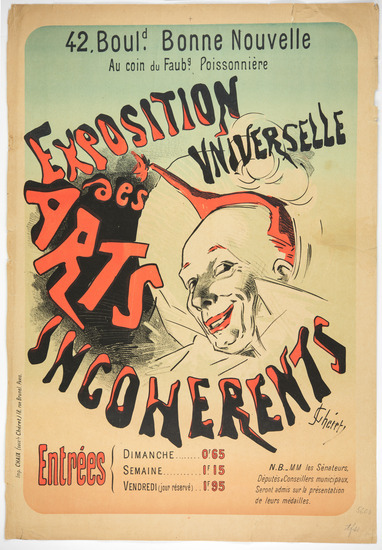 Jules Chéret: Exposition Universelle des Arts Incoherents, 1889; lithograph; 21 3/4 x 14 3/4 in. ; BAMPFA, gift of Lewis and Marjorie Ferbrache. 21 3/4 x 14 3/4 in. Stenciled black letters on burlap. The edges are sewn closed with white thread. 14 1/2 x 14 in. Join the curators of To the Letter for an in-depth look at the exhibition. Join artist McIntosh for a calligraphy workshop inspired by the artworks in To the Letter: Regarding the Written Word. 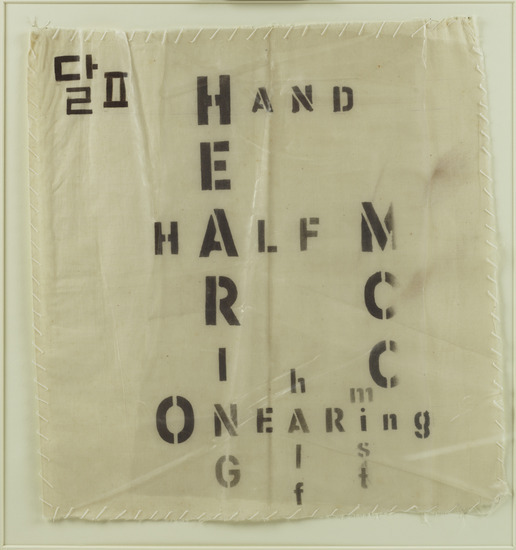 To the Letter: Regarding the Written Word presents a wide range of works from the BAMPFA collection that incorporate writing or letterforms as a motif or key theme. The exhibition includes prints, drawings, paintings, textiles, and photography from Asia, Africa, Europe, and North America, dating from the fourteenth century to the twenty-first. As the diversity of the works suggests, interest in the shapes—as well as the meanings—of letters and words spans cultures and times. In some cultures, writing grows out of pictorial traditions. The connection between Chinese characters and their representational origins is apparent, for example, in the striding legs of the character for “person,” 人 (ren); the serrated top of the character for “mountain,” 山 (shan); and the pendulous branches of the character for “tree,” 木 (mu). Perhaps it is due in part to this latent pictorial quality that Chinese and Japanese scripts lend themselves so well to the flowing lines of calligraphy. The Roman alphabet may be simple and visually banal by comparison, yet it too possesses the capacity to be rendered in dramatic fashion, as is evident in the work of graffiti artists over the last few decades. Not all of the works in the exhibition use letters to convey literal meaning or even represent specific letters at all. Rather, for some artists, it is simply the idea of writing that inspires the character of their marks. To the Letter: Regarding the Written Word is organized by Lawrence Rinder, BAMPFA director and chief curator, and Julia White, senior curator for Asian art.